Platts Steel Markets Daily provides transparent daily and weekly assessments of iron ore, coking coal & coke, ferrous scrap and ferroalloys prices, plus insightful analysis and commentary on the day’s market activities. With more than 80 price assessments published daily and weekly, and global coverage of news and markets, you can make critical decisions with complete confidence. 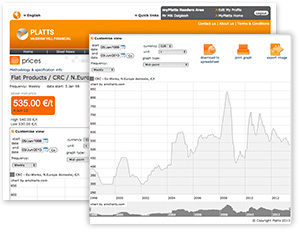 The premium subscription also gives you full download ability to the Platts Price Analyzer - to greatly aid your price modelling.